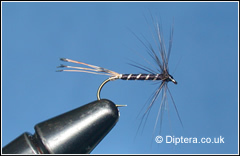 The black pennell is a great fly for both trout and salmon. It is normally fished on a floating line as the point fly of a team but also works on its own. Tied small it represents a small midge.